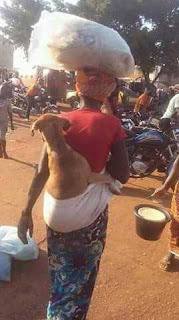 Home / Dog mama / Entertainment / Hilarious Photo of a Woman Carrying dog on her Back. Hilarious Photo of a Woman Carrying dog on her Back. The supreme Love of a dog! What should we call her now? Dog Mama abi Baby Mama! !